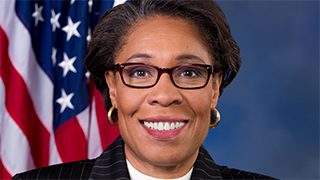 Congresswoman Marcia Fudge has represented the 11th Congressional District since 2008. Congresswoman Fudge is a committed public servant, dedicated to creating jobs; protecting safety net programs; and improving access to quality public education, housing, health care, and healthy foods. Congresswoman Fudge serves on the House Committees on Agriculture and Education and the Workforce and on several Congressional Caucuses.